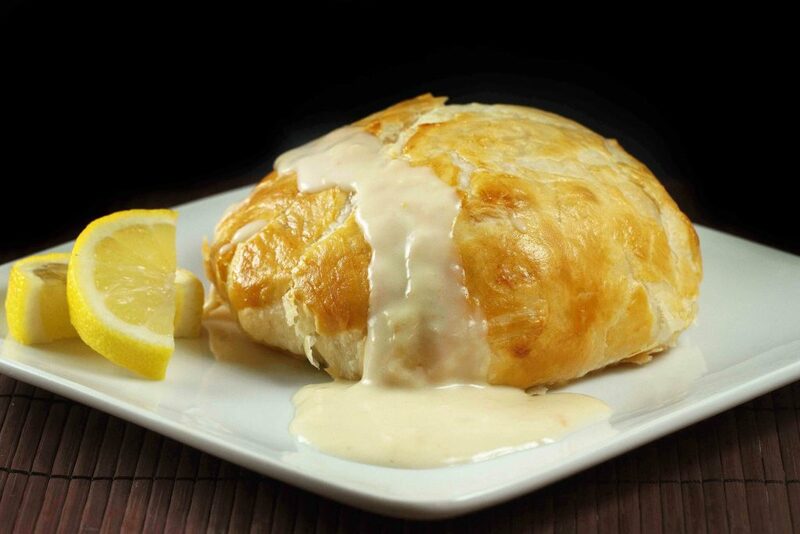 Chicken Breast stuffed with crab imperial wrapped in puff pastry and baked till golden brown. Served with a light lemon horseradish cream. Perfect for your next date night! When it comes to stuffed chicken breast, the sky’s the limit. And with my chicken breast stuffed with crab imperial and spinach, you’re reaching for the stars! My restaurant days were some of my happiest days, creating incredible dishes, having all eyes on me as I walked across the dining room, and the sheer joy on people’s faces as they enjoyed their meals! One of the more challenging parts of my job running the restaurant was deciding what my specials would be, what would I create to satisfy and amaze my guests. 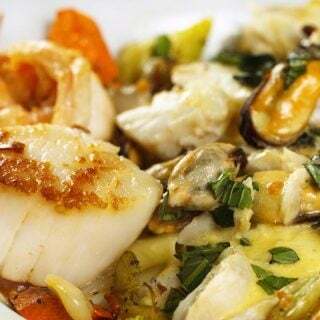 It was always easy to come up with show stoppers when using pricier ingredients, but not everyone that came in was looking for that high ticket entree, they were there to enjoy a good meal without breaking the bank. For those recipes I turned to chicken, it helped keep the cost down and allowed me to use some higher priced ingredients as well, blending flavors to make the dish enticing and delicious! I think the fact that I didn’t eat red meat helped me create some really good chicken dishes, and one that I’m going to share with you was always a favorite. Chicken breasts don’t require a lot of prep, but one thing you do want to consider when working with chicken breasts is that they do need to be pounded out a bit. Being a chef I always have a meat hammer to work with, but I have been at other people’s homes that didn’t have a specific meat hammer and sometimes you need to be creative. Of course, a regular hammer will do, just remember to wrap it in foil or plastic wrap first and use the side of the hammer, not the head. You can also use a small frying pan and give it a few whacks to flatten it out. I would, of course, suggest adding a small meat hammer to your kitchen if you don’t already have one, you’re going to use it and it will make your life easier! When pounding out chicken breasts, you do want to use the flat part of any meat hammer, not the ridged sides, the other side is reserved for beef or pork, meats that can use some help in tenderizing. It’s also a good idea to place a layer of plastic wrap under the chicken and one over top of the chicken before pounding. This will actually help in the flattening process, and keep little bits of chicken from embedding themselves throughout your kitchen! While pounding the chicken don’t strike straight down, you want to almost push the meat towards the outer edges while you pound. We want the breast intact and this is the best way gain size without breaking apart the breast. I stuffed this chicken breast with a crab imperial mix with some fresh spinach added in, and in Lisa would eat roasted red peppers you would have seen them in the mix as well. People eat with their eyes, so think festive and use colorful foods to add a little extra visual pizzazz to your dishes. If crab meat isn’t in your budget or just isn’t something you enjoy eating, you can always stuff your chicken breast with any of your favorites. Sausage, cheese, spinach and apples, would make a great stuffing especially for this time of the year, or if you would like to keep it simple how about a nice bread stuffing with mushrooms! The dish is yours be creative. If crab meat isn’t in your budget or just isn’t something you enjoy eating, you can always stuff your chicken breast with any of your favorites. Sausage, cheese, spinach and apples, would make a great stuffing especially for this time of the year, or if you would like to keep it simple how about a nice bread stuffing with mushrooms! The dish is yours be creative. I had intended to make a Dijon cream sauce for this dish, but had no Dijon on hand and just didn’t have the time to run to the store, so I made a Horseradish Lemon cream sauce, have fun with the sauce and use what you have on hand. When I developed recipes in my restaurants, I would use what I had on hand and just combine flavors that went well together, just don’t be afraid to experiment! Cook spinach in a little water until completely wilted. Squeeze out all the water from the cooked spinach. Mix mayonnaise, egg, sugar, and old bay together and blend well, this is your imperial sauce. Add the imperial sauce and mix together. (do not add all the imperial sauce in at one time in case its too much sauce for your mixture, the mix should be loose but not too loose.) Chill this mixture for at least 30 minutes, it will be easier to work with. Place chicken breasts on a tray and divide mixture between the four breasts. Wrap breast around the crab meat mixture, tucking in all the sides until a nicely shaped ball is formed. Place stuffed chicken seam side down in a casserole dish, adding a little chicken stock, or water in the bottom to keep the chicken moist, cover with foil and bake in a 350-degree oven for 20 minutes. Before baking, brush dough with a lightly beaten egg, place in 350-degree oven and bake for 20 minutes or until the pastry dough has a nice golden brown color. While the chicken is baking make your sauce. Melt butter in small pan, then add in the flour, allow the roux to cook for 5 minutes on low, do not let it darken or burn. Add in heavy cream and continue to mix if the sauce seems to thick add in more chicken stock or a little water. Add in horseradish, lemon juice and black pepper, taste and adjust according to your tastes, using more horseradish if you like. Serve chicken with lemon horseradish sauce and sides of your choice. *Do not overlap the pastry dough on the bottom, trim it so there is an even layer of dough, or it will not cook entirely and you will have raw dough on the bottom when you serve the chicken. I just ran across your recipe and would like to make it for guests. Is it possible to do a good portion of the recipe the day before –even baking the chicken breast- or must it all be done the day of. you can prepare the recipe up to the part where you wrap it in puff dough, the day before and finish the cooking process before your party. That’s how we use to do it at the restaurant, otherwise it would have taken too long. I served this recipe for my Mother’s Day main dish, along with asparagus spears. It was a hit! My chicken breasts were very large, so I ended up butterflying them into two halves and then pounding each half thin. Worked like a charm. The crab stuffing turned out perfectly, and the chicken was meltingly tender and moist. I don’t like horseradish, so I went with your original idea of a dijon cream sauce and substituted 1 tbsp grey poupon for the horseradish, which was a great choice. Sauce was delicious, and went equally well over the asparagus as over the chicken. Simply outstanding. This one takes a little time to get all the steps right, but my mom was astonished at the results, so it was very worth it. Adding this one to my recipe file for special occasions! Thanks, chef! Thanks so much for taking the time to leave a comment Anna, and I’m very happy to hear that everyone enjoyed the stuffed chicken breast! Anytime we can make our moms happy its a good day! thanks so much for letting me know that the chicken did turn out, even though it was a little dry. You don’t want to cook the chicken all the way through,so maybe next time give it a little less time in the oven before wrapping it, as it will finish cooking in the oven. I’m prepping this right now for my Sunday dinner!!!! I added the roasted red peppers and am anxious to see how it turns out!!!! Stay tuned!!!! I hope everyone enjoys it, Emily! Question for you.. My chicken breasts were odd shaped after pounding them out so making a ball was pretty impossible… I did the best I could and they are baking now.. Never used a puffed pastry before so I’m assuming that I can save the day with the pastry wrap… (Yikes) btw… Taking a lot longer than 20 mins for chicken to cook.. Should they be thoroughly cooked prior to wrapping the shell?? Thanks So Much!! Very interested in using this dish for my husbands 80th birthday, have people coming who are allergic to fish and pork so I will use a selection of veggies instead, do you think the chicken could be wrapped in Filo pastry instead of puff pastry. ? yes it can Lynda, Filo will work well with the dish. This sounds delicious, gonna try it…just wonder if the imperial source is only for crabmeat stuffing..I plan to use sausage and spinach…thanks. the imperial sauce is the binder, I use it for making chicken or turkey croquettes as well! Let me know how it turns out! I think it’ll be quite liberating to go pound pound with that hammer…I may never want to stop! You’ve had quite some cream in your life and on your chicken too! It’s truly sensual! kudos! This looks so awesome! The sausage, cheese, spinach & apple filling sounds great too! I love these restaurant kitchen posts. This looks wonderful and I would have happily ordered it. Have you ever made your own pastry sheets? That’s something I’d like to try, but I haven’t found any great recipes for it yet. not having been a trained baker, I have not made my own sheets, although I did find an interesting recipe for pastry dough I may be trying soon, so I can teach it too my girls! I’m glad you enjoyed my post! I made this last night and it was the best stuffed chicken I’ve ever made. Subbed a sausage apple stuffing as recommended, similar to this one http://www.cooks.com/rec/view/0,221,158183-232200,00.html. I was so excited that I forgot to make the sauce while it was baking and by the time I pulled it out of the oven and my supper guests got a peek at it they refused to wait for me to whip it up. This recipe is not hard to make but it takes a little time, perfect for a rainy day. Thanks! so glad that you made it and it was a success! thanks so much for letting me know, you just made my day! Oh my goodness. This looks insanely delicious. I have to admit, I never order chicken out because I hate how often it becomes bland – if they were serving anything like this I would have to try it! P.S. I like your “Miracle On 34th Street” motto, too! What everybody else said 🙂 — plus, I love the way you write. Such a pleasure to read! Love the lemon horseradish idea!!!!! Really like the sauce Chef! Gorgeous Chicken! Congrats on the top 9! My husband would absolutely love this – crab and chicken together! Congrats on the Top 9, Dennis!! I forgot to mention that earlier. I LOVE this sort of chicken recipe, and while I don’t really like to pound my chicken (my girlfriend got me a pounder, but I hardly use it) I just might do it for this one. Love it! Absolutely stunning photos, it looks so tasty! Congrats on the Top 9! Congrats on top 9! This is indeed an awsome recipe! A horseradish lemon sauce! Wow! You never cease to amaze me. I make a dish like this often but I love the little tweaks you’ve done I wouldn’t have thought of. Just wonderful. And congratulations — again! — on your Top 9! Great! This looks amazing! The crabmeat is a stretch for our guests…but thinking artichokes and spinach! Looking forward to trying! simply perfect. my mouth watered. Nay..you are still young and fit and we are counting on you for more recipes from your restaurant kitchen 🙂 Stay young ya ! This looks amazing…I will have to give it a try! I love that you wrapped the chicken in the puff pastry! These look spectacular–chicken has never looked so good! Your stuffed chicken is gorgeous, especially wrapped in the puffed pastry. i can see enjoying the wonderful dish with a nice glass of Chardonnay in the candlelight. Oh what a great recipe. It is also one of those ideas that just opens up a world of possibilities. This is also an excellent dinner party item as you can have it basically ready and then cook it before service. That is a fantastic looking chicken dish, Dennis! I’ve made a sausage-stuffed chicken breast recipe (one from Marcella Hazan) which is very good. Wrapping it in puff pastry, though, really puts it over the top! Thanks for sharing! I am eating cukes right now and I am SO wishing I had this instead. It looks so great!! Great recipe Chef! I’m really sad looking at my sandwich right now. Sigh. What a beautiful meal. The sauce also sounds so delicious. You always make such amazing dishes, Chef Dennis! 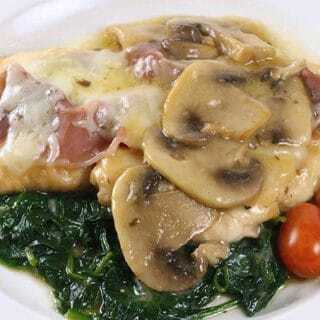 This stuffed chicken breast is a favorite of my son and I will surely try your version for my family. Thanks for always inspiring us with your culinary masterpieces! 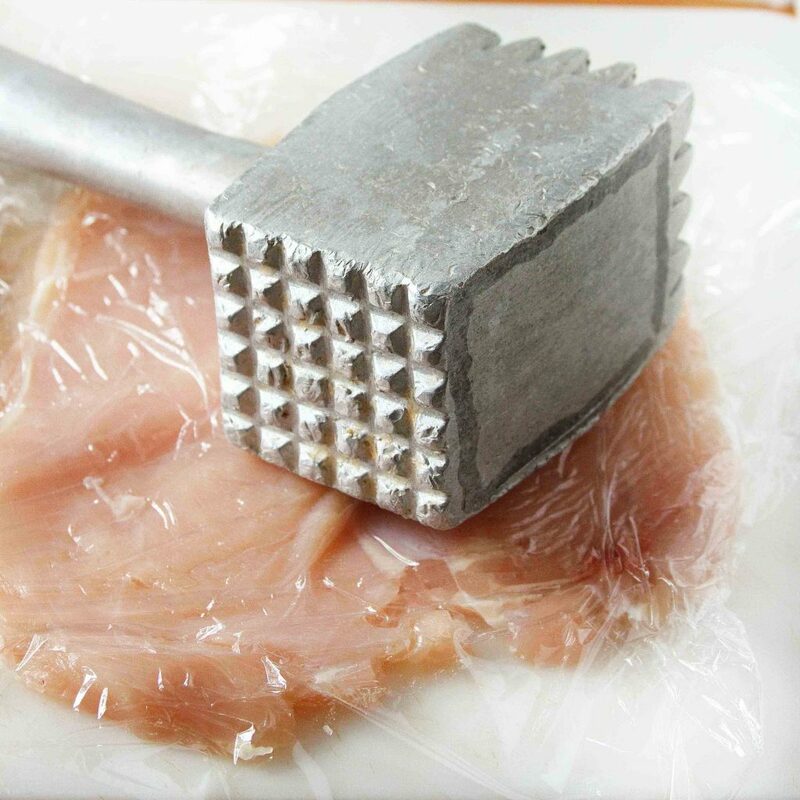 Chef: I’ve been using the wrong side of the hammer when pounding out chicken. Thx for setting me straight! 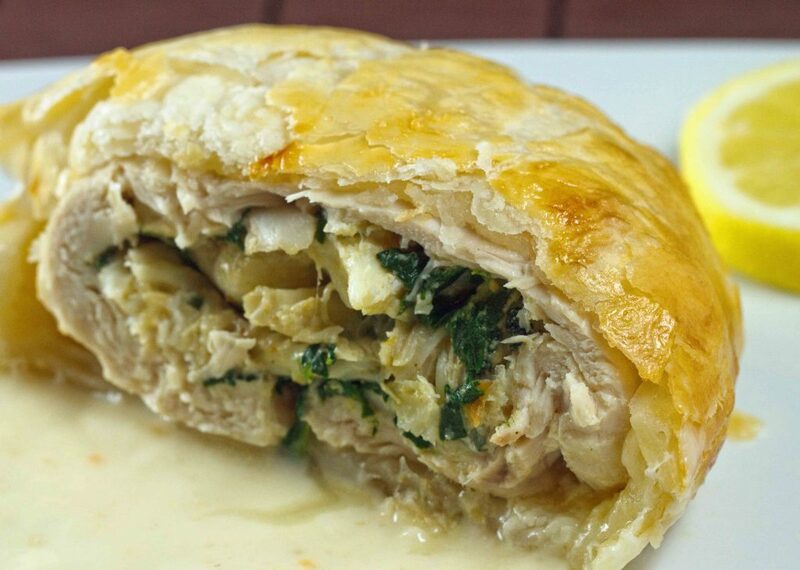 😉 I do luv puff pastry and this Chicken Moliere is just what I’d like for dinner tonight. Have a fabulous week! Another amazing recipe from you! I loved stuffed chicken breasts so I know this has to be delicious and I like that you wrapped the chicken in the pastry puff! It looks so elegant! Crab stuffed chicken? Count me in! Beautiful photo and a creative stuffing idea. This stuffing in the chicken sounds amazing. The whole dish just looks perfect! How about coming to cook dinner here for me one night?! So many possibilities with the stuffing Chef. I can see this being a family favorite. The pastry looks perfect! I love what you stuffed it with too. I just ate breakfast & I swear if one of these were in front of me I would devour it! Looks great and happy birthday! That last photo is making my mouth water! Fabulous dish, Dennis!!! Heaven on a plate – absolutely perfect! Sadly we battle to get crab meat here – can only source king crab at exorbitant prices. 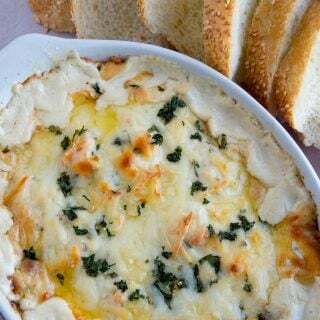 Love the stuffing – great idea using crabmeat. And so glad you didn’t have the Dijon – that lemon horseradish sounds absolutely delicious. Good luck with the 16hrs – we’re thinking of you! 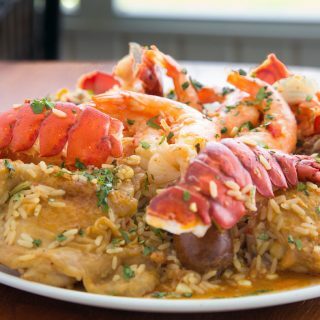 Omg, this dish is over the top! I’ve had chicken stuffed with crawfish, but never with crab meat! I can only imagine how scrumptious this is, and that sauce is just fabulous! Good luck with your busy days and remember to take time to relax, now and then. Thanks for another great recipe! I love that there is pastry around this chicken! And the stuffing sounds amazing too. I am actually happy you did not have Dijon mustard on hand or I would have missed out on that delicious lemon horseradish sauce!!! Delicious! Crab meat would be in my list to use, but with allergies, I’d do spinach, pine nuts and maybe a wee bit of garlic and parmesan. I love, Love, LOVE the sauce you made with it! I hope the classes go by quickly and productively! Chef, You’ve rocked this chicken dish! The tasty photo drew me in, but the flavor profiles seal the deal. Filed under “Must Try”. Bravo, good man! I love stuffed chicken, but have never added a second meat to the stuffing. Usually it’s full of veggies and cheese 🙂 Yours looks delicious! It’s crazy to think, but I’ve already survived 6 weeks of my school year. The beginning of the year business has subsided and it’s sort of nice to fall into a routine again. Hope your busy days slow down a bit soon! This looks great and I would never think of stuffing it with crab meat. But then maybe if it was MY birthday I’d think of it! HAPPY BIRTHDAY CHEF DENNIS! As you are in the midst of your long haul I hope you had a bit of relaxation and football today. Ok I know about the past in fashion photography but did not know you ran a restaurant. Hoping for a fill in on that! Thanks for the consistently beautiful food. This is a wonderful reminder for the cooler weather and to spark creativity for filling. Great recipe Chef! I have it already printed and shared. Thanks! What a beautiful dish! The pastry looks perfectly done with that chicken. Great technique. That is so awesome. I have always been a backyard smoker and grilling guy, and obviously that’s why my blog is in that niche. But lately I have been reading so many different food blogs, I have learned so many things and have been expanding my cooking. I always wanted to know how this process was done. I’ll be trying this one. Wow! This sure what a marvelous recipe, Dennis! Looks like you did an amazing job!